“Land of the long white cloud” in Maori. New Zealand comprises of two main volcanic islands, the North Island and the South Island and numerous smaller islands. The country is situated between the Tasman Sea and the Pacific Ocean, at 1500km east of Australia and 1000km south of the Pacific Island nations of New Caledonia, Fiji and Tonga. Due to New Zealand’s remoteness, it was one of the last lands to be settled by humans. New Zealand is a constitutional monarchy with a parliamentary democracy. Queen Elizabeth II is the Queen of New Zealand and the head of state. She is represented by the Governor-General, whom she appoints on the advice of the Prime Minister. The Governor-General can exercise the Crown’s prerogative powers and the reserve powers they are limited by constitutional constraints and they cannot normally be exercised without the advice of Cabinet. There are two political parties that usually dominate the elections in New Zealand, National and Labour. The Head of Government is the Prime Minister. The Prime Minister is indirectly elected, meaning they are not directly elected by the people of New Zealand but become Prime Minister by becoming the leader of the largest party in Parliament following a general election. Formally, they are appointed and dismissed by the Governor-General of New Zealand. The Coat of Arms depicts a shield with four quadrants divided by a central “pale”. The first quadrant depicts the four stars on the flag of New Zealand; the second quadrant depicts a golden fleece, representing the nation’s farming industry; the third depicts a sheaf of wheat for agriculture; and the fourth quadrant depicts crossed hammers for mining. The central pale depicts three galleys, representing New Zealand’s maritime nature and also the Cook Strait – part of the ocean that divides the North Island and South Island. The Dexter supporter is a European woman carrying the flag of New Zealand, while the sinister supporter is a Maori warrior holding a Taiaha (fighting weapon) and wearing a Kaitaka (flax cloak). The shield is topped by the Crown of St. Edward, the Monarch of New Zealand’s Crown. Below is a scroll with “New Zealand” on it, behind which (constituting the “heraldic compartment” on which the supporters stand) are two fern branches. This is a flag that you could see a lot in New Zealand. Its name is “The Tino Rangatiratanga flag” and is often referred to as the Maori flag. 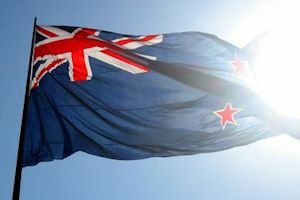 They are two national anthems in New Zealand, “God Save the Queen” and “God defend New Zealand”. Those two anthems are equal but “God defend New Zealand” is most commonly used as the national anthem. New Zealand is the one of three countries to have two equal standing national anthems.